The first and foremost thing the home grower needs to know about blueberries is that they have a literally vital need for a very specialized kind of soil: highly acidic soil, with a pH in the range of 4.0 to not over 5.5 (ideally from 4.5 to 4.8). That is a most unusual soil, and it is thoroughly unlikely that you will have it, or anything like it, naturally. There are, of course, ways to alter soil pH, even fairly drastically; but it is our experience, supported by reports from elsewhere, that to so drastically modify any material amount of soil that is not somehow physically segregated from its environment is something from difficult to impossible in a reasonably practical sense. Does that mean that we give up on blueberries? Not at all. Blueberries have very shallow root systems, and are thus ideally suited for container growing. But, if we are going to grow them—or any perennial plant—in containers outdoors, there are some things we need to realize and allow for. Blueberries are famously cold-tolerant—one often sees remarks about overwintering through -20° or even -30° (or sometimes even -40°); that’s swell, except those aren’t plants in containers, they’re plants with their roots snuggled into good old Mother Earth, and soil has quite a temperature-buffering value. When plants are grown in containers, their root systems tend to wind around the inside of the pot near the walls of it, and so are almost in contact with the outside air: university studies have shown that the root balls of outdoor containerized plants reach very nearly the outdoor air temperature. That is the chief thing we need to take into account when considering growable cultivars. One source suggested as a rule of thumb subtracting 2 from one’s USDA Zone; since we are about on the borderline between Zones 5 and 6, by that rule, we should be looking for cultivars that are described as hardy down to at least USDA Zone 3. On the other hand, our summers, while short, are quite warm, so we also need cultivars that are known to fruit well in hot weather. There’s yet more jugglery about climate effects, for we in our region are pinched a bit at both ends of the season: we don’t want early ripeness, lest late-spring frosts damage the crop; but we don’t want terribly late ripeness, lest the berries not ripen before autumn frosts. (As noted, blueberries are quite cold-hardy—but that’s the plant, not the berries proper.) The old shibboleth about selecting late-harvest types to avoid damaging spring frosts is an error: while harvest dates for different blueberry cultivars vary substantially, most cultivars actually bloom within about a week of one another, and it’s the blooms that get damaged by late spring (or early summer) frosts. Our late spring frosts can hit in early June, but that’s about the latest; our fall frosts can arrive from late August on, but that’s not so important. As the TV hucksters put it, “But wait! There’s more!” Blueberries come in a few fundamental types: so-called “high-bush” and “low-bush” types, more recently also “half-high” types (a hybridization of high- and low-bush types), and so-called “rabbiteye” types, which are best suited for gardeners in southern climates. (High-bush types are sometimes considered to be further subdivided into “southern” and “northern” types.) Each has its own growth style and climatic needs. Most of the blueberry cultivars you will see in seedsmen’s and nurseries’ catalogues are of the “high-bush” type, which—as the name suggests—typically make relatively large, high bushes; the “low-bush” types, common in New England both wild and domesticated, are typically rather smaller in growth, and less time has been put into developing specialized cultivars of them—indeed, they are rarely offered (when offered at all) by cultivar, but rather as either just “low bush” or sometimes as “Maine” blueberries. High-bush: if grown in outdoors in containers, may not be sufficiently cold-hardy in our climate, because the root ball is, for all practical purposes, exposed to the ambient air temperature. Low-bush: being so low—typically only a foot high—and rather dense, they are something of a nuisance to harvest, and are not as productive, per bush, as other types. Rabbiteye: best adapted to southerly climates. Half-high: very cold-hardy (normally down to Zone 3), reportedly better “real blueberry” taste than the more common high-bush types (meaning, we take it, that they are less likely to have been bred out for that quintessentially American culinary desideratum, sweetness), fairly productive, easily containerized. 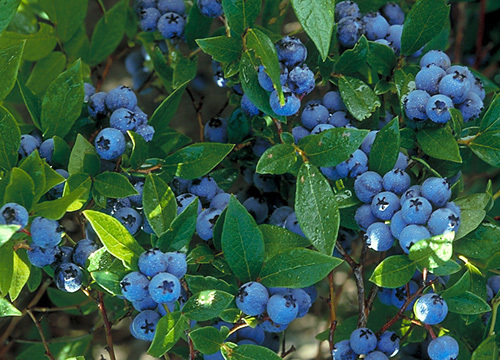 Northblue: typical height, 1½ to 3½ feet; vigorous growth habit; berries are large and dark blue, with flavor reportedly superior to most highbush cultivars; at maturity will produce 3 up to 12 pounds of fruit per bush per season; self-compatible. Described as “a real workhorse; a very reliable cropper”. Probably the earliest half-high. Fall color particularly vivid. Northcountry: typical height, 1½ to 3½ feet; very hardy, vigorous and productive; at maturity will produce 3 up to 12 pounds of fruit per season per bush; fruit is medium-size for blueberries with sweet “wild” blueberry flavor; fall foliage scarlet red; self-compatible and so can be planted without another pollenizing cultivar, but yield and berry size benefit from cross-pollination. Relatively early. Chippewa: typical height, 1½ to 4 feet; midseason berry; at maturity will produce 3½ to 7 pounds of fruit per season per bush; berries quite light blue; fruit medium to large, and sweet; yield and berry size benefit from cross pollination. Mid-season crop. There remain several other types also worth consideration, especially if your preferred nursery doesn’t have all of the types cited above. Included in this lot are Northsky (low-growing), Northland (slightly less cold-hardy), Friendship (late season), Bluegold (late season), and Patriot (slightly less cold-hardy). There may be others yet, but that should be enough to be going on with. For the benefit of those who either are in a more favorable climate than ours or are willing and able to provide acidification of in-ground soil, here are our earlier notes on regular high-bush blueberry types. Reviewing the available literature with a regional focus, our conclusion was that the following three cultivars, presented here with some notes, seem the aptest (note, though, that different sources often assign different maturity classes to given cultivars). You can form your own conclusions by following the several links given farther below. The three varieties described below can all grow up to 4 to 6 feet high, and typically produce anywhere from 3 to 12 pounds of fruit a year per plant—depending on the individual plant and the micro-conditions—when into full maturity (which can take a few years). Notes: Cold hardy. Spreading shape requires extra side pruning. Resistant to root rot and adaptable to wetter, heavier soils than most blueberries. Consistent yields. Berry: Large; light, bright blue; firm, resistant to cracking, small-medium scar. Notes: Adapted to areas with hot summers and cold winters; upright growth. Small, tight fruit clusters. Notes: Adapted to heavy soils and a wide range of sites; high antioxidant capacity. From the available literature, we’d give the edge to Blueray, but—given room and suitable conditions—growing all three seems a good idea (if you have room for four, try two of Blueray and one each of the other two). Remember that most cultivars, though technically self-fertile, will yield more and better if cross-pollinated—so try to plant at least two cultivars (and if you plant more than two bushes, try to plant them in a sort of “block” pattern, not a row, if at all possible). This discussion is focussed on container growing, but the applicability to direct in-ground growing is simple enough. And remember again that virtually all blueberry types will be more productive if cross-fertilized, so grow at the least two varieties. a handful (per plant) of soil sulfur. Some other sources recommend other formulae, such as an equal-parts mix of peat moss, mulching bark, and “acid planting mix”, but the formula above was the winner in a supervised trial of various mixes. It is quite important to check the pH of your blueberry plants’ soil fairly frequently and reasonably accurately; one of those little probe-in-the-soil pH meters is a wise investment. If the pH gets up over 5 or so, it’s time to take action. (Blueberries can supposedly tolerate a pH up to 5.5, but we repeat that 4.5 to 4.8 is the optimum range.) One easy soil amendment is soil sulfur, but be aware that it is notoriously slow-acting (some say literally years). More useful, perhaps, is cottonseed meal. You can also try iron sulfate, which can be a bit pricey if you’re doing a lot of area, but should be no major consideration if you’re just fine-tuning the soil for a few plants. Ammonium sulfate is not advised, despite some available recommendations of it (it turns toxic too easily). Note that the acidifying effect of peat moss in the original mix will wear off after some years (typically 6 to 10 years), and you may then need to re-pot the bush, or take to making heavier pH amendments, as circumstances suggest. The final size of your blueberry container is in some respects up to you. Some home gardeners report success with pots as small as 12 inches, but that would likely be cramping the bush’s growth rather badly. The Royal Horticultural Society, for one, suggests a final container of up to 20 or 24 inches in size; many find that the classic half-barrel available at many gardening shops—and which is typically 24 inches across—makes an excellent blueberry container. The initial container size is another matter. Most sources seem to feel that the slow-developing blueberry is best started in a smaller container, lest the soil stay very wet and rot the roots. Blueberries are peculiar about water: they want and need a lot, but are shallow-rooted, so the soil should drain well (hence the perlite in the recommended mix). Though detailed recommendations vary from source to source, in general it seems that a satisfactory approach is to transplant the blueberry bushes as received from the nursery into 12-inch pots for starters, then after a season or three (use your eyeballs and common sense) into their final home, a 20- to 24-inch pot or planter. First warning: never use any fertlilizer containing nitrate on blueberries—it will probably kill them. Be sure to use only a fertilizer specific for high-acid plants, something like Camellia/Azalea/Rhodedendron food; check the label to assure that it indeed is specific to high-acid plants, and explicitly mentions blueberries somewhere, and that it has no nitrate in it. Don’t fertilize your blueberries right away after initial transplanting. Instead, fertilize them lightly 4 to 6 weeks later. Use an appropriate high-acid-plants food at a rate of about one ounce per year of plant age, up to a maximum of 8 ounces per plant per year for mature plants. Divide the fertilizer into three portions and apply one portion around Valentines’ Day, one around Memorial Day, and the last around Labor Day. Remember again that blueberries are very shallow-rooted. Water frequently and heavily, but be sure the soil drains well so you have no standing water. Figure on supplying 1 to 2 inches of water a week. The plants’ need for water is greatest from the time of fruit expansion through harvest. It is best to supply the water as steadily as possible—ideally daily—so that the fruit does not crack from uneven growth. Drip irrigation, if conveniently feasible, is a good approach. Do not, though, apply water after early September unless the soil gets really dry: blueberries need to start “slowing down” to prepare for winter dormancy, and if you try to keep them going too long, they won’t be fully prepared and can suffer freeze damage. Like all bushes and trees, blueberry bushes are optimally productive when properly pruned for optimum growth. Since blueberries are slow-developing, it’s important that they be well established before one begins trying to maximize their fruit. That in turn means pruning vigorously when they are young to assure that they do not over-fruit, which would stunt their long-term growth. Pruning should be an annual task, undertaken during the bush's dormancy (hereabouts, usually March or April is best). Prune lightly the first two years to remove low branches, overlapping branches, and flower buds (so there will be no fruit). From the third year on, remove old canes and weak spindly shoots. Prune out overlapping canes and branches and head back very vigorous upright shoots to force branching at a lower level. Reduce very heavily branched canes by one-third. On mature plants, remove older stems lacking in vigour. Remove thin, twiggy stems as well as any damaged or diseased shoots, crossing or horizontal shoots (marked a in the diagram at left) or stems close to the ground (b in the diagram). 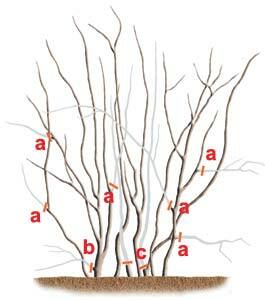 Cut back some branches to the base (c in the diagram) and others to strong upright shoots. Stems that fruited the previous year should be pruned to a low, strong-growing upward-facing bud or shoot. By the time you’re finished pruning an established bush, you should have cut out roughly 15 percent of the old growth. Because blueberries need moisture close to the soil surface, it is important to mulch them well. Use 2 to 4 inches’ depth of bark mulch, acid compost, sawdust, grass clippings, or the like, and refresh the mulch covering every year or two. In winter time, be sure to protect the blueberry bushes against wind damage and drying; one simple and effective method is wrapping them in burlap. Blueberry bushes are best initially planted out during their dormant season (which usually means March to April in eastern Washington). You can get stock that is anywhere from 2 years old (usually bareroot) on up (usually container). If you buy 2-year-old bareroot stock to start with, don’t let it bear fruit for the first couple of seasons, else the plant will go puny on you; 3-year-old and up container stock can be allowed to (and often will) set fruit in its first season. It costs a little more, but we think it’s a wiser investment to start out with the older, larger, healthier stock. And, needless to add, be sure to buy from a reputable specialist, preferably one fairly close by (to avoid shipping damage). Last but by no means least, if you don’t protect your blueberries from pests, especially birds, you simply won’t get any. Birds are famously good at pecking out blueberries as they ripen. Use a mesh of no larger than 1-inch size. If you have a substantial planting, you can build a simple gated walk-in cage out of two-by-fours and lightweight metal mesh; for just a few bushes in pots, it makes the most sense to use inexpensive plastic bird netting. If you prefer, you can build a small cage structure to support the netting, or you can just cast it about the bush, removing it only while you are actively harvesting berries. Be sure to protect against rabbits, mice, and voles as well as birds (meaning make sure your protection is sold down to ground level). Starting Right With Blueberries - advice on planting and growing blueberry bushes from a large specialist blueberry wholesaler. Blueberries arose in North America, and were well known to native Americans as a valuable food. In modern times, the native species have been crossed and their growth habits modified and selected for, giving a great variety for the grower to choose from. Blueberries have lately been found to be jam-packed with health benefits, so many that it would be almost comic to list them. You loaded this page on Friday, 19 April 2019, at 17:00 EDT. It was last modified on Saturday, 9 February 2019, at 19:21 EST.